Warner Bros. Studio Tour Hollywood offers a three-hour visit where guests can tour a real working Hollywood studio. Explore the sets and soundstages that brought classic movies and TV shows like Casablanca, The Big Bang Theory, La La Land, Gilmore Girls, Friends and many more to life. Our knowledgeable Tour Guides will give you an intimate behind-the-scenes look at original props and costumes used in films from Wonder Woman at the DC Universe: The Exhibit, to the Wizarding World of Harry Potter and the Fantastic Beasts located inside the Warner Bros. Archive. Guests also visit the Picture Car Vault showcasing some of Batman’s most famous vehicles throughout the years. The tour concludes at the interactive soundstage at Stage 48: Script to Screen – an immersive experience providing a hands-on introduction to the world of filmmaking. Guests can re-enact a scene on the original Central Perk Café set from Friends, ride a bat-pod through Gotham City using green screen technology and so much more. Visit our website at wbstudiotour.com for more information. WB Shield & © & ™ WBEI. 8:30AM-3:30PM Daily with extended holiday hours. Closed Christmas Day. Warner Bros. Studio Tour Hollywood brings you closer than ever to the legendary entertainment you know and love. Get ready to explore our iconic backlots, The Archive and The Picture Car Vault. 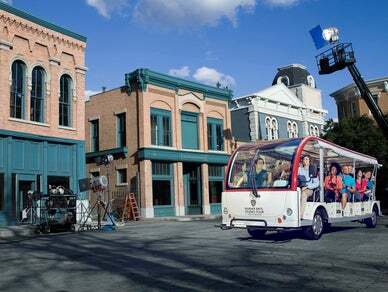 Plus, you'll view one of our many soundstages where today's hottest TV shows and movies are made. With actual filming happening all around you, no two tours are ever alike. For the grand finale of your Studio Tour experience, you'll visit Stage 48: Script to Screen. This exciting addition to our legendary backlot explores key phases of the entertainment production process. From the writer's lounge to the Warner Bros. Legacy Room, this 45-minute, self-guided experience offers a truly immersive and interactive look at how the magic of Hollywood is made. Tours last approximately 3 hours.